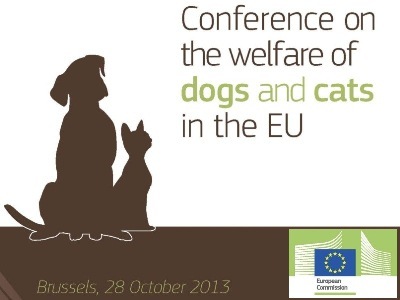 A web streamed conference dedicated to the welfare of dogs and cats in the EU: building a Europe that cares for companion animals will take place in Brussels on 28 October 2013. In conjunction with the Lithuanian Presidency, this conference will bring together stakeholders, government authorities, NGOs and those with a professional or personal interest - with an opportunity to discuss for the first time at pan-European level issues of dog and cat welfare. Amongst the distinguished keynote speakers, Mr Tonio Borg, European Commissioner for Health and Prince Laurent of Belgium, a keen animal welfare supporter, will deliver opening addresses. It is estimated that there are over 100 million owned dogs and cats in the EU. The rise in their lucrative trade has however produced problems such as: genetic selection, puppy farming, mutilation and inhumane disposal having far reaching consequences. Today, there is no harmonised EU legislation to address these welfare concerns. The conference will also provide the platform to launch a study into the welfare of dogs and cats involved in commercial practices. Based on the results of the study and this conference's proceedings, the Commission will consider what further action is necessary in order to improve welfare conditions of companion animals.